The larger writing on this page is of the early 10th century. 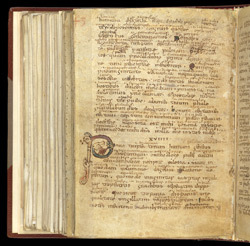 The smaller writing between the lines are glosses or words written to aid the reader's understanding, mostly done in the late 10th century in Latin and Old English. The intensive glosses are an indication of how difficult Aldhelm's Latin prose is to read. During the 10th century many earlier manuscripts were glossed in this way because the church was trying to raise standards of learning. This page displays an initial bristling with animal heads, one of many throughout the manuscript. Its warm, soft colours, fanciful beast heads, and curving interlaced three-dimensional stems are typical of early 10th-century decorative styles.